I'm working on a huge update post. To tide you over until then, I'm pulling more images from my railroad photo collection. 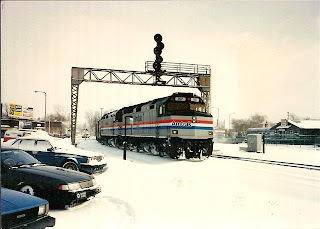 About 10 months ago, I posted a photo from a wintry day in January 1995. Tonight, I pull another couple of scans from that same day, taken in the morning at a town about 15 miles to the east of the previous photo. Here, we see the Lakeshore Limited gliding its way to the depot, probably running behind schedule. The train seldom ran on time, earning it the derogatory moniker Lateshore Limited. The cool thing about this photo is that the tracks leading up to the depot are covered with snow, providing the illusion that the train is running atop nothing at all, not much differently from the magical train in the book The Polar Express. The wedge shape of the pillars supporting the signal bridge is very retro, don't you think? 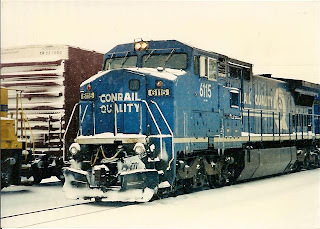 The second photo is a closeup Conrail 6115, a General Electric C40-8W (six axles, 4,000 horsepower, 8 series, wide cab). This photo was taken as the engine was idling on the outskirts of the east side of a very large railroad yard. The spray of snow on the engine's pilot and the icicles dangling from the locomotive's frame just give one a feeling of "brrrr". After CSX and Norfolk Southern carved up Conrail in 1999, this blue mammoth would find itself in the CSX camp with engine number 7325. Someone took a rather beautiful shot of it on Iona Island in New York in the summer of 1999. It has gone through two different paint jobs since then.